– Any type of main colour yarn will do, just choose your needle size as appropriate to the yarn weight. Ideally you would like to create a fabric tight enough so that the stuffing does not show through. Green Elephant was knit with US #4 double pointed needles and measures approx 7.5 cm (3 inches) from trunk to bum, 9 cm (3.5 inches) ear to ear. 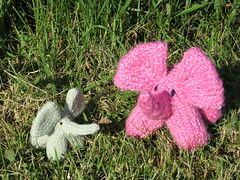 Pink elephant was knit with US #6 double pointed needles and measures approx 12.5 cm (5 inches) from trunk to bum, 13.5 cm (5.25 inches) ear to ear. Using double-point needles, CO 8 sts. Divide sts evenly between needles, place marker and join to begin working in the round, being careful not to twist. Round 1: [KFB] in each st. 16 sts. Rounds 2-11: K all sts. Transfer live stitches to holder. Divide live stitches from all four legs around 3 needles so that BO sts all face the center of triangle. Rounds 1-2: K all sts. Round 3: K2, K2T, K8, SSK, K4, K2T, K8, SSK, K2. 28 sts. Round 4: K all sts. Round 5: K1, K2T, K8, SSK, K2, K2T, K8, SSK, K1. 24 sts. Now would be a good time to pause, turn your knitting upside down on a table and sew the legs shut using the 6 inch tails you left when casting off earlier. There will be 4 short seems running from the center to the outside edge each joining 2 legs together at a time. Round 7: K2T, K8, SSK, K2T, K8, SSK. 20 sts. Round 8: K all sts. Round 9: K9, K2T, K8, K2T.18 sts. Stuff legs and body/head. Transfer the lone stitch from Needle 2 to the needle with 8 sts. There should now be two needles with 9 sts each. Kitchener stitch shut, leave approx 4 inch length of yarn at the end, this will form part of the elephants tail. Round 2: K to last 2 sts, SSK. 11 sts. Round 4: K2T, K to end. 10 sts. Repeat Rounds 2-5 twice more. 6 sts. Cut yarn, thread tail through remaining stitches, gather and tie tightly. Stuff trunk and attach to body on opposite side from the length of yarn remaining from kitchenering the body. Purl 1st and all odd numbered rows. Row 2: K2, M1, K2, M1, K2. 8 sts. Row 4: K3, M1, K2, M1, K3. 10 sts. Row 6: K4, M1, K2, M1, K4. 12 sts. Row 8: K5, M1, K2, M1, K5. 14 sts. Rows 10: K all sts. Row 12: K all sts. Row 14: K all sts. Row 16: K4, K2T, K2, SSK, K4. 12 sts. Row 18: K3, K2T, K2, SSK, K3. 10 sts. Row 20: K2, K2T, K2, SSK, K2. 8 sts. Row 22: K, K2T, K2, SSK, K. 6 sts. Row 24: BO all sts. Fold ear in half so that CO and BO edges are together. Sew together side seams (do not stuff), attach to body. Using tapestry needle and an 8 inch length of main colour, pull yarn through the last stitch that was kitchenered on top of the body so that 4 inches dangles on either side. Use this and yarn end left from kitchenering body shut to braid a short tail. Use a contrast colour to embroider eyes. Your little elephant is complete! This is adorable! I’ve never knit toys before, but I want to make this my first. Thank you! Your little elephant is abosolutely adorable! Your little elephant makes me smile. What a great design! PERFECT!!!! I was looking for a little something to go along with a baby sweater for a baby shower, and this is PERFECT!!!! Thank you so, so much! Hey there, I was wondering if I could link to this in my blog! May I? Thanks so much for the feedback everyone, I’m thrilled to hear you like the little guy. Loved it! A perfect gift when visiting little ones over the holidays. Much appreciated. I love this pattern, can’t wait to start it. Oh my goodness – I just saw this pattern and had to comment — that is just too cute – I collect everything elephants so this would be a lot of fun to make if I can – I love knitting so this should be a fun challenge. Thank you so much for the use of the pattern. I am sending it to my friend who is away at a music camp and she will be ecstatic to receive it, I am sure! ^^ Thanks again! 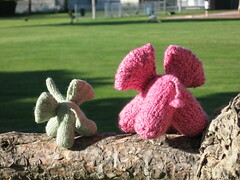 I knit 4 of different colors and then doubled (not exactly just doubled) the pattern to make a “mommy” elephant. My nephew loved them! So has everyone else that’s seen them. I can’t keep up with the orders from friends and families! Thanks so much for sharing! I’ve tried to attach a picture. I hope it worked. Great job Christine, thanks for posting the pattern. 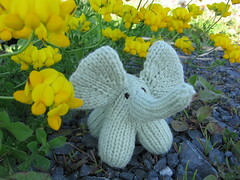 I wanted a really tiny elephant so knitted your pattern using size 1 needles and Claudia sock yarn. My elephant came out 2.5″ from feet to tip of ear and 2.5″ from ear tip to ear tip. Perfect ! I did a second one, this time making the legs and body a little taller and adding short rows for a head. I followed the rest of your pattern on out and ended up with a very handsome mate for the first little charmer. The pair should make excellent Christmas presents this year.